From Halloween through New Year’s Day, the holiday season is right around the corner, and many Granges host special events - from Bazaars to Festivals to Christmas Parties and more. It is also the time when Granges tend to cultivate community service projects - such as having a drive for non-perishable food items, collecting toys for underprivileged children, making favors for nursing homes, hosting a carol sing for the elderly, and more. This is the perfect time for Granges to: amp up their marketing and promotions, and reap the benefits the holidays provide. What does your Grange want to accomplish during the holidays? The first step is to answer the question, and then plan a themed event or activity to achieve your goals. Remember to be sure that what you are planning is relevant to your community, and makes people feel good about what you are trying to achieve. Once your Grange event or activity is planned, the next step is getting the word out. Utilize the resources that are available at little or no charge — mass emails to members, press releases, posters, a sign in front of the hall/meeting location, social media such as Facebook and Twitter, and old-fashioned word-of-mouth. Start early, and make your promotions timely to the event. Use visuals such as photos and videos in your marketing, and make your call-to-action the centerpiece of your promotions. Folks receive a lot of ads and promotional pieces during the holidays, so make sure yours stand out from the crowd. Make it personal, engaging and easy for folks to participate. The holidays are the most memorable season of the year. Granges should be taking advantage of these opportunities. Need help? The Public Relations Committee is ready to lend a hand. All we ask is that you give us plenty of advance notice to ensure we can fulfill your needs. 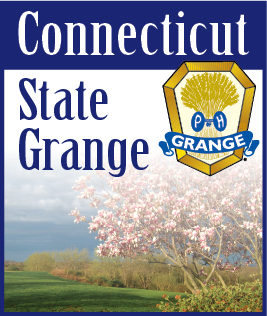 information@ctstategrange.org or publicrelations@ctstategrange.org for more information.